As discussed elsewhere on this blog, the late 1960s and early 1970s more or less represented the ultimate in kitschy lows for paperback adventure/espionage covers, and I thought the present Nick Carter offering was fairly representative of the ultimate in sleaze. But a glance at the various versions of the same title suggests that the present entry is, if anything, on the mild side in tacky and tasteless. I must confess that the cover tableau of the half-naked, half caste(?) 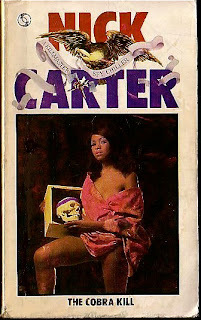 girl rather proudly displaying a skull in a box does get one’s attention.